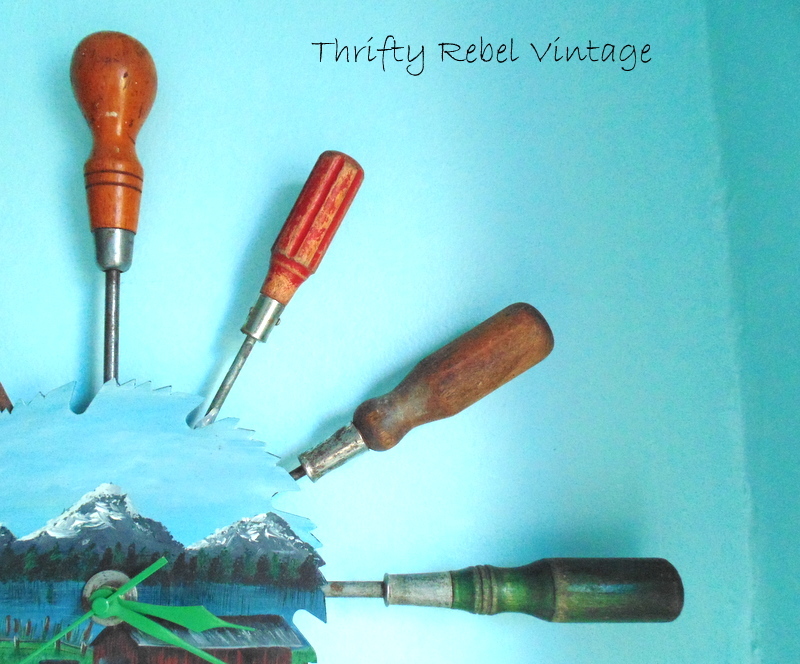 I have a thing for vintage tools, and the more used they are the more I love them. 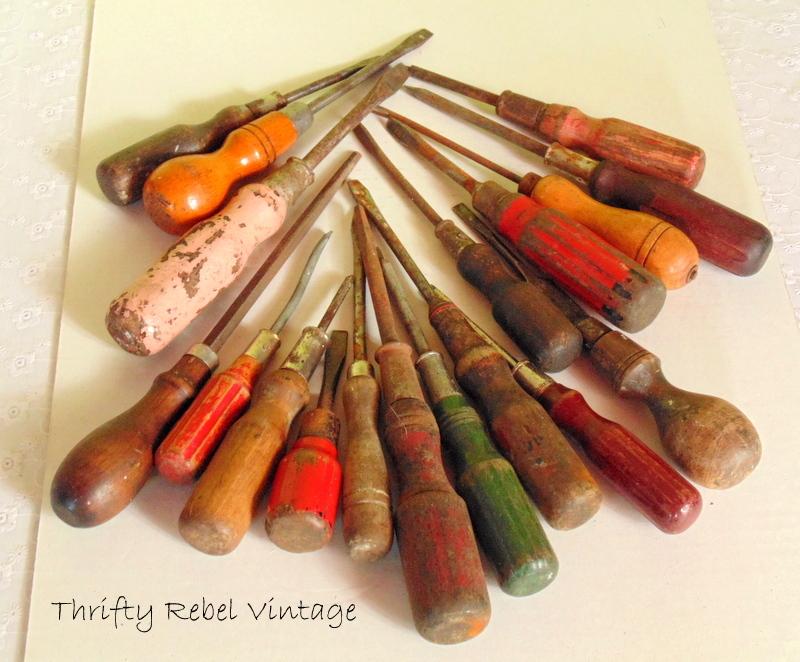 This past summer one of the tool collections I started was vintage wooden screwdrivers. I found my first few early in the summer, and I had a screwdriver sunburst clock project in mind for them right from the get go. But I had to find more, and thankfully by visiting garage sales over the last couple of months I was able to do just that. Here’s most of my collection. All together they cost me about $8. Many of them have that lovely patina that makes me giddy with happiness. There are even two pink ones. Can you see them? Yum. 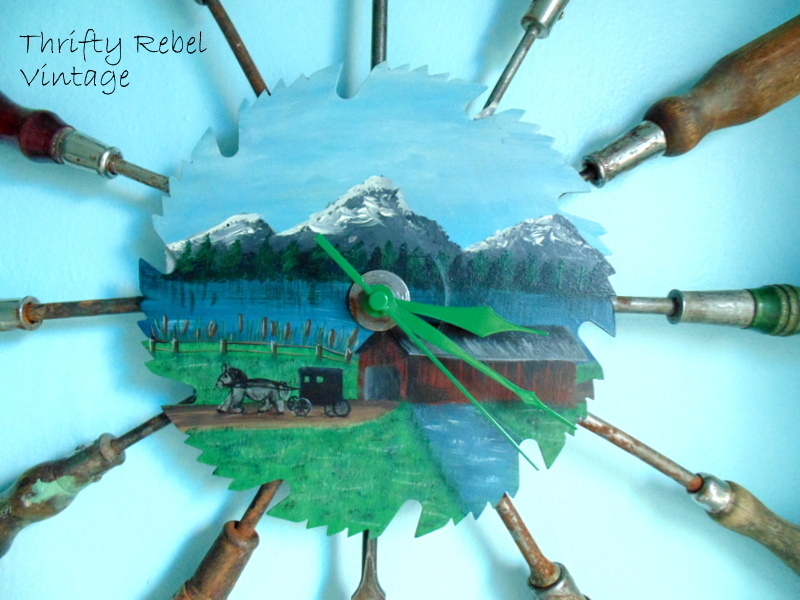 Once I had more than enough screwdrivers I couldn’t decide what to use for the clock face. I could see the finished project in my mind’s eye, and I had several ideas… but I put it aside because I wasn’t really happy with any of them. Then one day I was perusing my local thrift store shelves on my lunch hour and there it was… right in front of me, and I had one of those meant-to-be thrifting moments. I scooped it up before anyone else could see my treasure. It couldn’t have been any better, and I couldn’t believe that I found it… for $1. 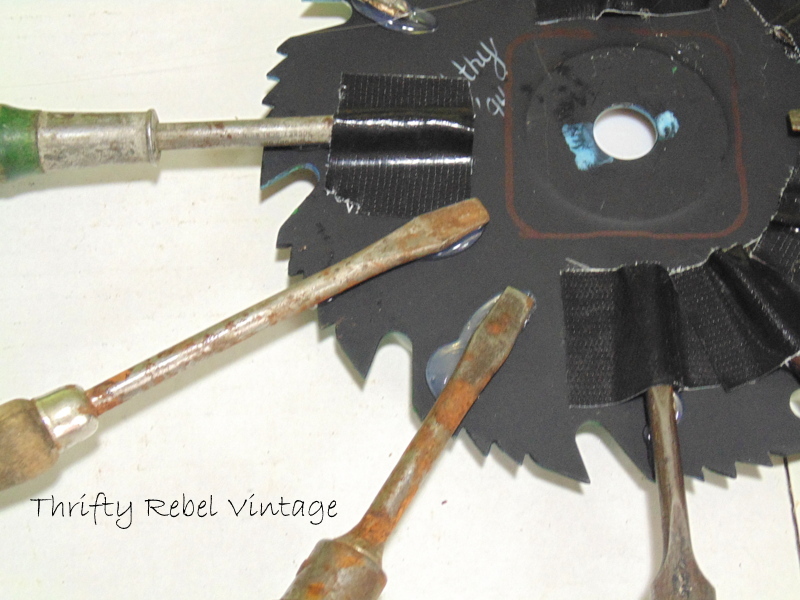 A circular saw blade. I knew the moment I saw it that it was meant for my clock. I marked around my clockworks with a Sharpie so I knew how much space I had to work with on the back. Wait until you see what’s on the front! The back was signed by someone named Kathy in 1994. 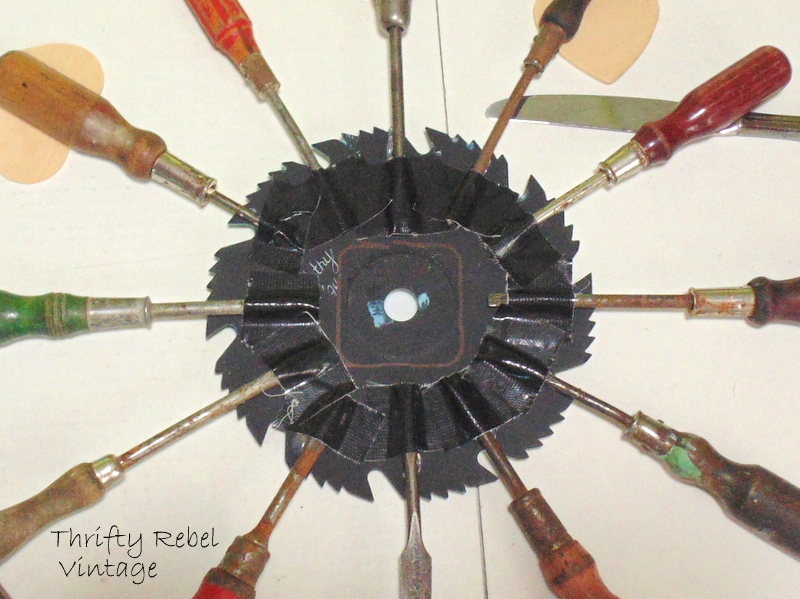 I couldn’t bring myself to permanently adhere my screwdrivers to the blade and I usually listen to my gut instinct when it comes to these things, so I had to come up with another way to attach them.. Enter my glue gun and gorilla tape. If you have no qualms about permanently attaching the screwdrivers you could use a permanent glue like Marine GOOP or E6000, or maybe gorilla glue would work too. You might still have to use some gorilla tape though, just for extra support. 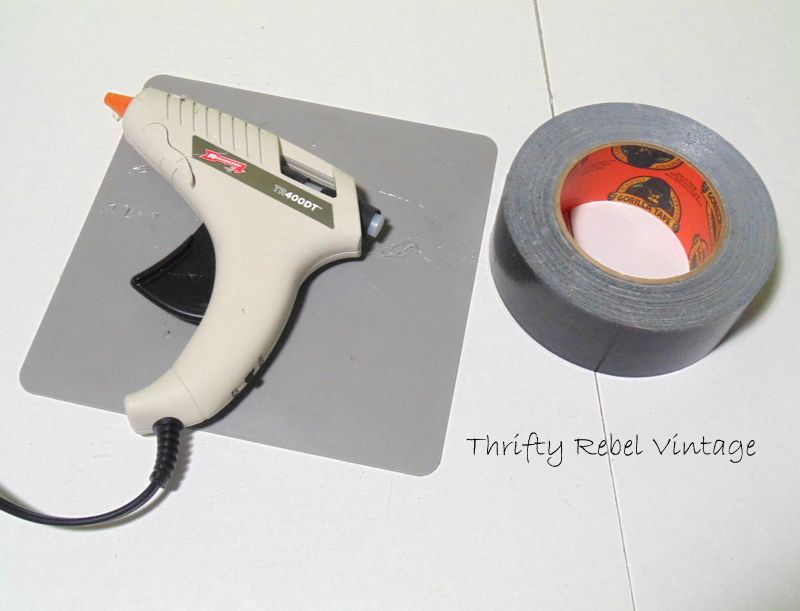 The glue gun was used just to hold the screwdrivers in place while I taped them down. Even though these screwdrivers are not that heavy (I didn’t use the largest ones) the hot glue wouldn’t hold them on its own. Each screwdriver was placed to represent the hours one through twelve and I just winged a pattern that I thought looked good. Some of the handles were not as thick as others so I put something under them while I worked. Here’s the back all taped up. It’s important to wrap the tape as tightly over each screwdriver as possible. Gaps in the tape will allow them to loosen. I used a clockworks from my lazy suzan tray into clock project that I did a few years ago, added a washer for the centre… and it was good to go. The hands were already painted green and I thought that was perfect. They don’t take away from the beautiful hand-painted picture. We don’t have mountains like that here, but we do live in Mennonite country and we see horses and buggies all the time. Thanks Kathy, whoever you are… you did a fabulous job. 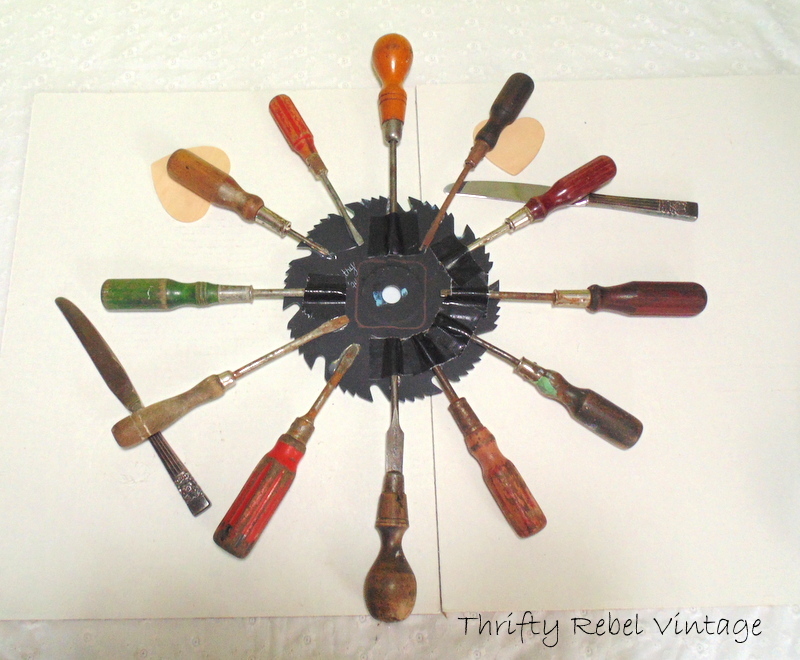 Whenever I look at my screwdriver sunburst clock I imagine how many projects these were used for, how many fix-it jobs they helped with, and how many hands held them over the years… and it makes me happy. It measures about 19 1/2″ by 19 1/2″. Here are a few close ups. I left the screwdrivers as I found them. All I did was wipe them clean with damp paper towels. I left the dents, wear, rust, paint splats… and whatever else was on them. It’s all a part of their history after all… and that’s what made me fall in love with them in the first place. 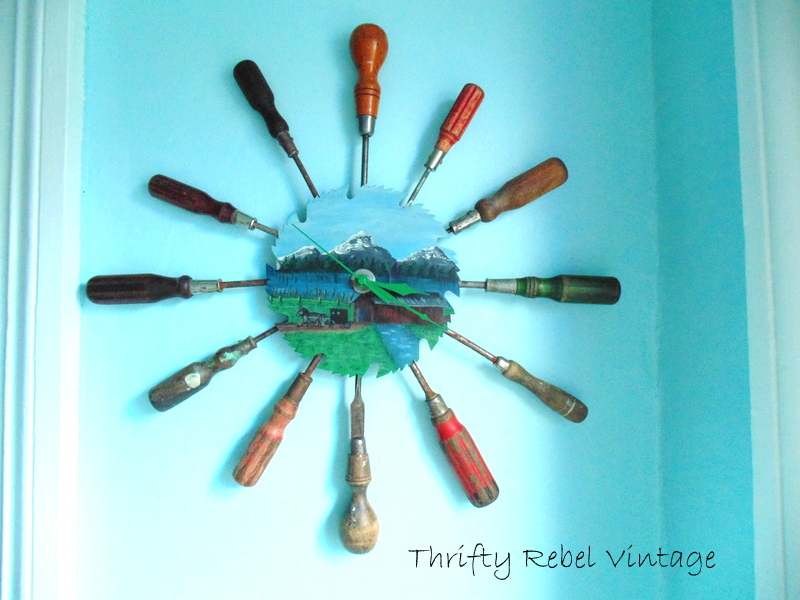 Now that I have the finished sunburst clock on my wall I’m in love with these screwdrivers even more. I just might have to attach it all together permanently. For me this is a keeper. A – MAZ – ING!! Those screwdrivers are so special. 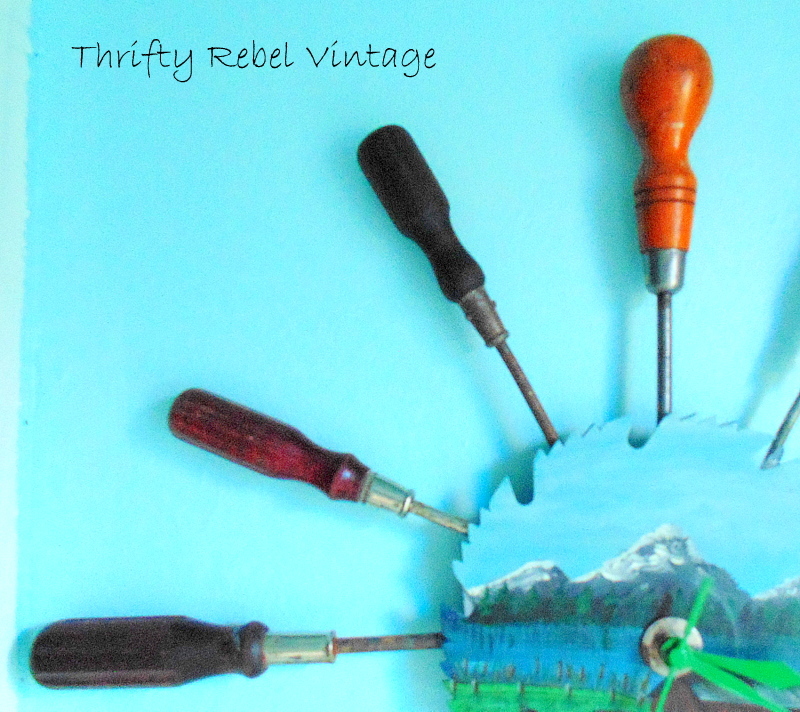 I share your love of vintage tools and garden tools! Thanks AnnMarie! I’ve been collecting a few other types of tools as well, and I’m hoping to find ways to repurpose those . I love old garden tools too! Another amazing creation from talented Tuula! Your creativity amazes me. Thanks Mother Deer. 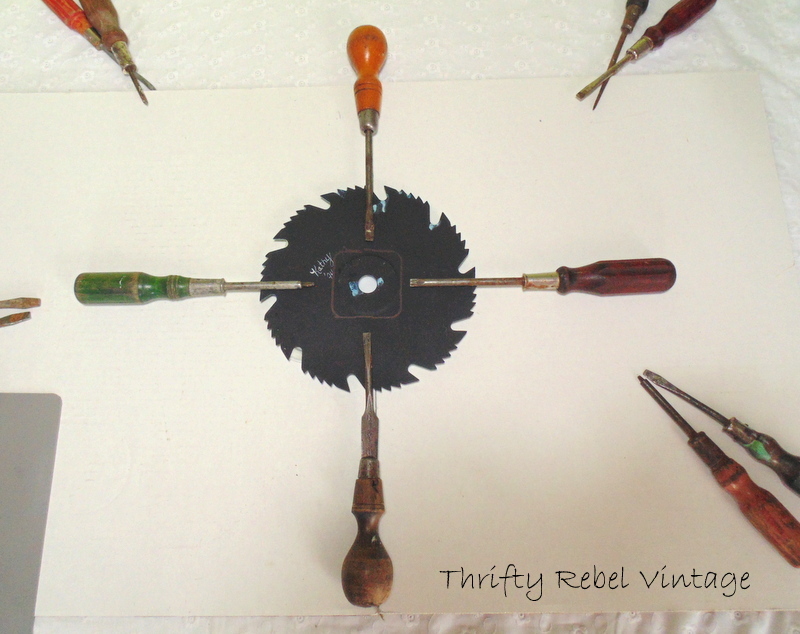 There’s nothing like a few vintage tools to make me happy. Tuula you never seise to amaze me with your creativity. This is awesome. Oh my goodness. Thanks a million Dona! wow! That saw blade was indeed meant just for this project. Perfection! Thanks Debbie! I was so happy when I found it, and I love the hand painted picture. LOVE LOVE LOVE THIS! that is all I can manage as I drool over this creation! I was making up a whole tale about the buggy guy using old screwdrivers to repair the covered bridge. There is definitely a story in this clock. Oh yes, the tales old tools could tell. My kind of stories. Very clever, I like it!! I am pinning this. My dad has drawers of screwdrivers and I seem to have a buildup of dull sawblades! I love this Tuula. Thanks for sharing! Thanks for pinning Karen! Hope you make one… or two… or many. Wow, what an imagination you have!!! 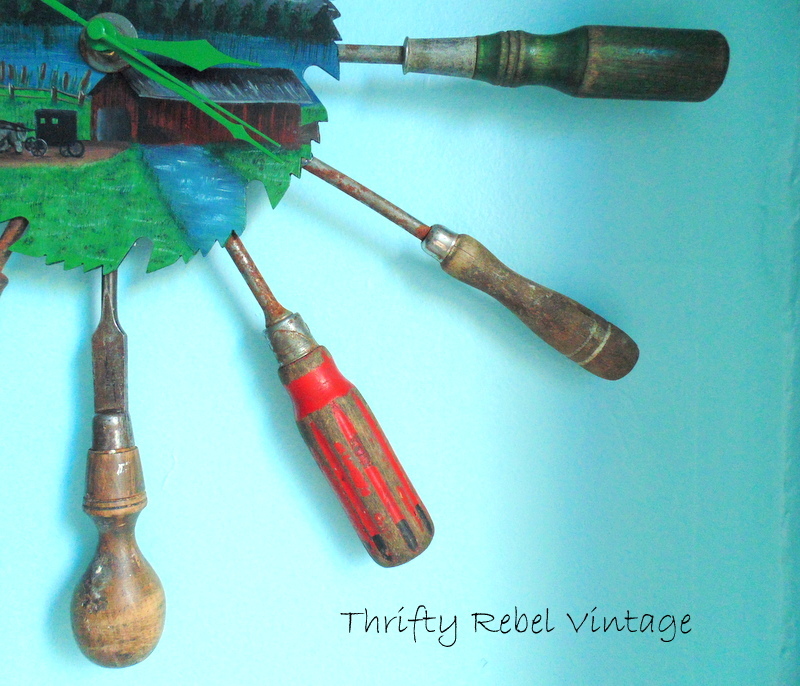 This is so clever and such a fun way to use your screw driver collection. Oh yes, I love those pink ones. Thanks so much for sharing at Vintage Inspiration Party. Thanks Betsy! 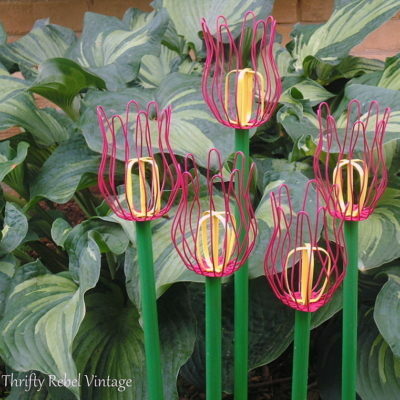 I do love the pink ones too. LOVE THIS!!! 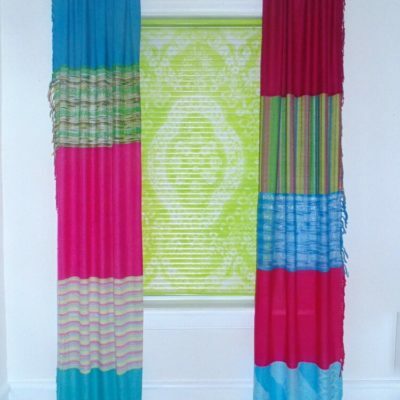 Such a great idea and it looks awesome!! Great job!! Your screwdriver sunburst clock is amazing. I absolutely love it. 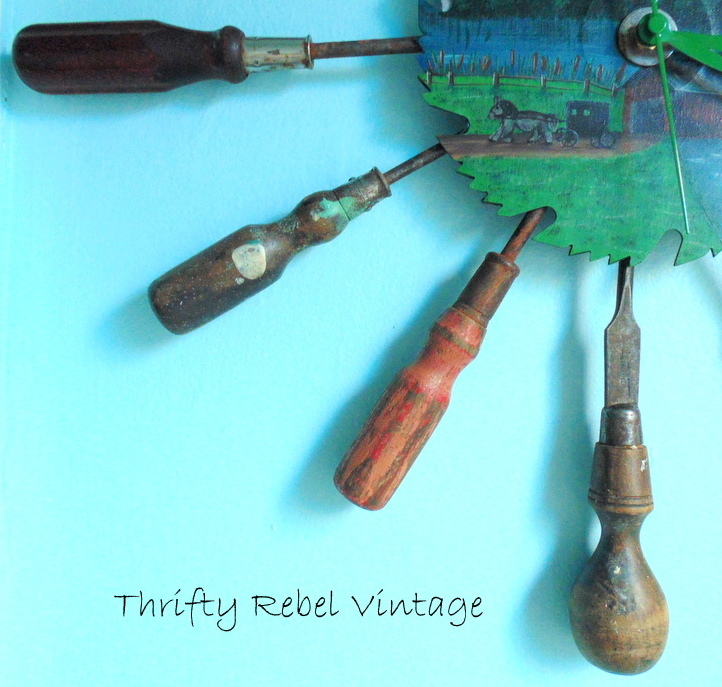 There is a new vintage link party Vintage Charm starting up this coming week on Thursday October 15th at 8:00 AM ESTand I would love for you to join at http://www.bluewillowhouse.com. Your links will be seen on four vintage blogs. Hope to see you there. Thanks so much Sharon! 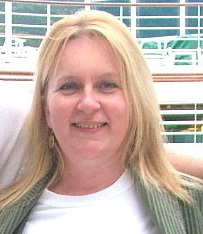 I’m a friend of Diana’s from Adirondack Girl at Heart and I’ll definitely be popping in to the party. Thanks for the invite. Oh my!!! Such a FUN clock!!!! Thanks so much Diana! I was thrilled to join the first party, and hope to join many more in the future.